Members of the Rhinelander Lions Club are once again collecting deer hides and deer tails. The hides will be sold and money raised will be used for camper scholarships at the Wisconsin Lions Camp in Rothsholt. 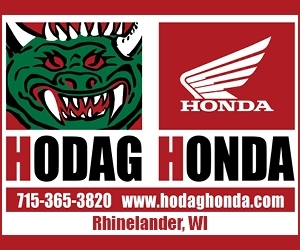 Donated hides should be deposited in barrels locateed at the drop-off area next to Hodag Gun & Loan, 2261 Lincoln Street Rhinelander. Donations of salt to protect the hides would also be appreciated. For further information call Tom O’Rourke, 715-362 6543, Bill Haenel 715-282-7583 or George Scholz at 715-272-1770. The Wisconsin Lions provide a week of summer camping free-of-charge to eligible youth and adults with disabilities from Wisconsin. They serve youth and adults who are blind or visually impaired, Deaf or Hard of Hearing, youth who function socially or educationally as having a mild cognitive disability and youth with diabetes. Deer Hide and Tails will be accepted October 15th through December 31st.